At the recent International Live Events Association’s annual conference ILEA Live 2018 in Denver Colorado, Brent Mather, design principal at Gensler, spoke on how technology is shaping future architectural design. One of his key points is that technology’s impact on cityscapes will, among other things, result in less need for parking spaces. Because driverless vehicles are set to hit the market in five to eight years. Once they hit mainstream popularity, it’s Mather’s opinion that people won’t need to own cars when they can rely on driverless car services. The domino effect of that will be that half as many city parking stalls will be required, so he imagines tall parking structures being repurposed into retail, office and housing dwellings. As he spoke from an architect’s point of view of how roads and re-purposing buildings will affect construction, I couldn’t help think how this might impact the event industry. What will driverless cars mean for live event spaces? Venues: Some clients always want to stage events in the downtown core so they, and guests, don’t lose work time travelling from the office. A driverless car, however, means that event attendees are able to keep working while in transport so considering a venue on the outskirts of town or even hours away is definitely feasible. Plus, there will be no driver to send home upon arrival. This will open up smaller markets for larger conferences, which means they need to prepare larger spaces in anticipation of future new business. The additional bonus: Venues in downtown locations can potentially expand by re-imagining their parking facilities into more event space – yippee! Vehicles: Vehicles could be redesigned to accommodate “meeting seating.” Since you won’t have to be at the wheel, let’s put in swivel seating so you can have a mobile meeting on the way to a venue! 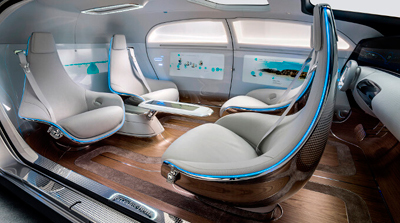 This story’s photograph features a Mercedes F-015 Concept Interior which looks like a very comfortable space to work in while enroute to a meeting or event! Transport: While safety may be a primary benefit for the move to driverless vehicles, if companies choose that mode of transportation for delivery, how will they accommodate customer service if there is physically no driver for you to reach? How many times have you had an event shipment you needed to check on or give the truck parking instructions because the loading dock was already full with delayed load-ins? The logistics of it all is in the works: Check out Budweiser’s first transport delivery with a driverless truck. Katie: Attendees with mobility/accessibility issues will increase since they can travel on their own and don’t have to rely on Wheel-Trans or a public system. Hanna: More alcohol consumption will happen if there is no need to drive. This means more revenue for the venue. However, social responsibility is still a big concern for companies/organizations and driverless cars bring a whole new set of liability issues to the table that will require solutions.